Winter is well and truly here. Some lovely sunny frosty days followed by starry nights. After a long Autumn with tomatoes and peppers still cropping in November we had a few days of freezing temperatures down to -10 to finish off the summer crops. The freezing weather bought beautiful dry sunny days to lighten the heart and ease the working day. Allowing us to enjoy tidying the land, putting beds to rest and preparing for next season. It has been an excellent harvest year for so many crops. This year i tried a new root vegetable called Mashua (Tropaeolum tuberosum) from the nasturtium family. Grown in the Andes, particularly in Peru and Bolivia, and to a lesser extent in Ecuador, for its edible tubers, which are eaten cooked or roasted as a vegetable. Mashua is a herbaceous perennial climber growing to 2–4 m (7–13 ft) in height. It is related to garden nasturtiums, and is occasionally cultivated as an ornamental for its brightly coloured tubular flowers. 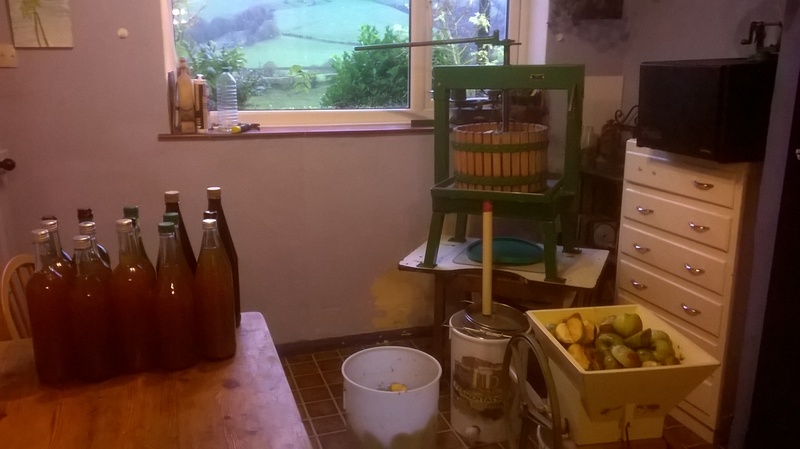 We have collected a bumper crop of apples this year, mainly from other peoples trees, although our trees are starting to come into production now. 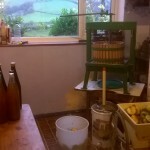 We pressed apple to make juice which we bottled and pasteurised to keep as juice. It’s a slow process, but we managed to do about 70 bottles. We also got a small crop of quince and medlar from our trees this year. The new raised flower beds are now finished, filled with muck and bark mulch, which will rot down over the winter ready for spring planting. Dave has been busy with machinery maintenance, in the hope that next summer we always have a mower working. The pigs are getting big and are working as very productive rotavators. They have already cleared the ground ready for the new flowering hedge and lavender beds. The pigs are moving onto new pasture each week, clearing land ready for a potato crop next spring. As the piglets get bigger it is not taking them long to turn the land into a muddy mess. Flowers cropped well all season with fresh flower bunches going to the shop until the last week in November, when they were joined with dried bunches of mixed arrangements and lavender. With Christmas just around the corner i have just harvested an assortment of different coloured willows, which will be woven into wreath rings.